This is a quick example of how to use websockets in an ESP8266 device. I wanted to experiment with websockets and this was a simple way to do it. The device runs the websocket server and its code is very similar to what you can find in this example. On the other side, the client is a Qt (QML) application. I think QML is an easy way of developing applications and the advantage is that you can use the same code in a smartphone or a desktop PC. If you prefer, before reading this article you can find the source code repository here. Now it's time for the WSClient class. The following code shows how the websocket client is created. It is an unsecured socket (the arduinoWebsocket library does not provide a wss (SSL) server). There are two important signals; the one that is triggered after the connection is established and the one that occurs when is disconnected. After that the websocket is opened using a valid url. 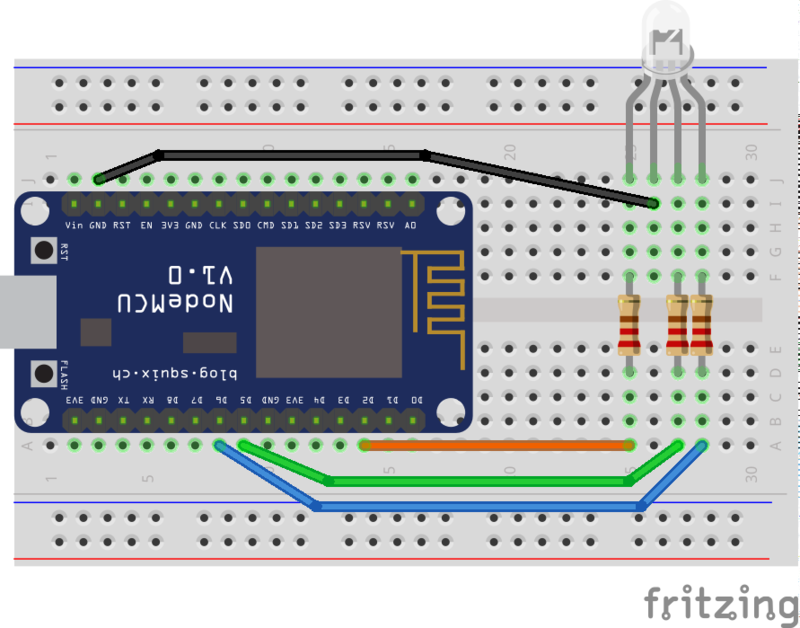 The onConnected slot is the responsible of changing the led color again to show that the client is connected to the NodeMCU. In other words, the green color will be changed to red by this slot. The RGB code is transmitted through the websocket to the NodeMCU. In the device (explained later), the code is split to obtain each of the red, green and blue values which are converted to integers and sent to the corresponding PWM pin. The new signal-slot connection is not important and it is used to print debug messages. In a similar way we use the onDisconnected slot to print debug messages reporting the reason of the disconnection. Finally, there is a slot to send the color selected in the color picker through the websocket. The next code is the definition of event that will handle the received messages. For the color codes we have to shift the data to get the red, green and blue values separately. After setting up the WiFI Access Point we start the websocket server and link the previous event function. Then, the MDNS service is configured and the html page that can be used to control the device is included. After that, we can change the color to green. Remember that the PWM limits for the NodeMCU are from 0 to 1023, differing from Arduino (0 to 255). Instead using the QT application, another option is to launch in a web browser this URL: http://esp8266.local (if this doesn't work try http://192.168.4.1). You will notice three sliders corresponding with the RGB values. Just change them and you will see the new color in your led.